We have developed an interactive platform to offer the best environment to prepare Situational Judgement Tests (SJT) and the case study. Our module is interactive, dynamic and duplicates real conditions that you will get during your recruitment procedure. Our interactive testing module has been designed to reproduce a realistic test environment used by recruiters. 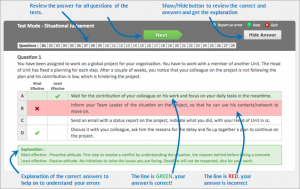 After a test, you can review your performance by using the revision module. You will review all the questions of the tests, check your answers and have an explanation for the correct answers. The revision module will help you to identify your strengths/weaknesses, and learn from your practice experience. With the answers' explanation, it will reinforce your knowledge. This page will provide you the result of the practice test you did. 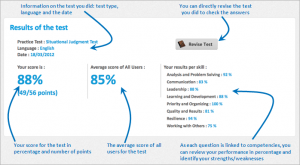 You will have your score, the average score of all users that did the test and a detail of the performance for each core-competencies. On that page, you can also quickly access the revision mode of the test, to review your answers and get explanation of the right answers. 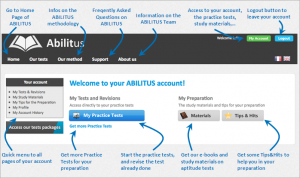 This page will provide you the access to practice tests. You simply need to select the languages, the difficulty level (depending the test type) and then click on the start button! Very easy! You can review your performance over the time : check your results and compare it with the average of the users. 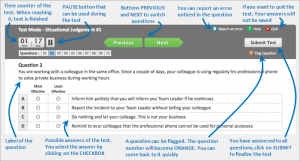 Through the table, you can access also the revision module for each test completed.